I must admit, the notion of eating at a private members’ club as a non-member always seems odd to me. As I mentioned on the night, I think it’s for this reason that I’ve never previously ventured in…I think I’d made the assumption that non-members would be treated differently as they haven’t paid vast amounts of money to be there. My misconceptions were quickly put to bed. Membership is only £200 per year, and on their website, The Square are keen to point out that ‘members are accepted regardless of race, creed, gender, age or complete lack of dress sense’. All that we had to do was to sign in as non-members in the visitors’ book at the front desk. The two-AA rosette restaurant also surprised us. It boasts an elegantly decorated dining room, with exposed brick walls and smartly laid tables, but these are at odds with the fun, graffiti-style framed artwork and long, ‘Wagamama-style’ tables that mean you could be sitting side by side with a complete stranger. 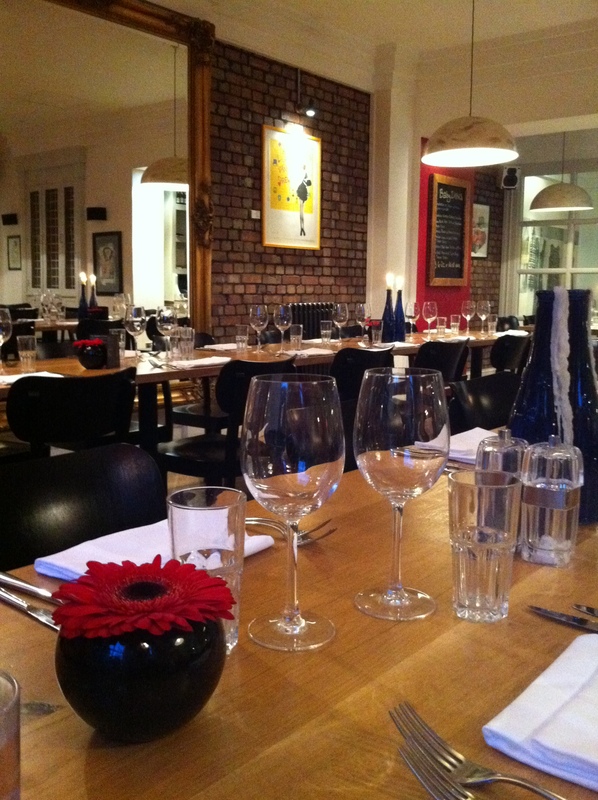 We chose our starters from the ‘Baby Dishes’ selection of the menu, priced at £4.50 each or three for £12. 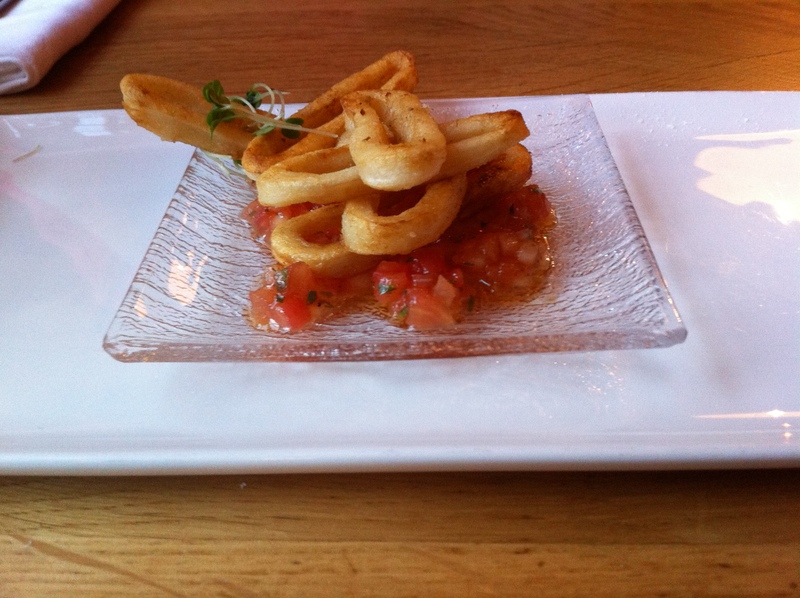 For Ingrid, the pan-fried marinated squid rings with tomato salsa. It’s always refreshing to see a restaurant serving squid rings without a greasy batter coating, allowing you to enjoy the flavour of the squid itself. And what a flavour…the squid was perfectly cooked and not at all rubbery, and the finely chopped salsa had enough flavour to hold its own against the squid but to work as a complement to the seafood, not overpower it. 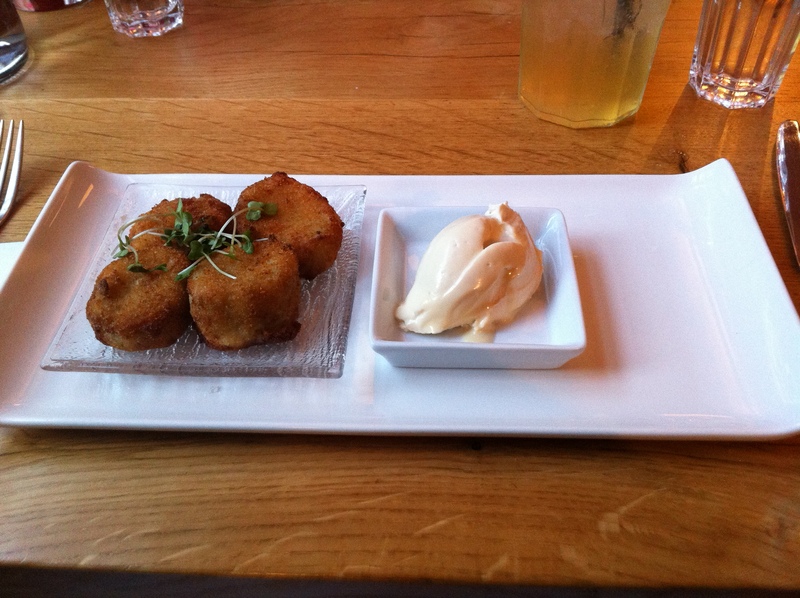 I’d decided on the Cheddar cheese and leek fritters with a cider sauce. A cream rather than a sauce, admittedly, but still delicious – the sweetness a perfect foil for the savoury saltiness of the fritters. 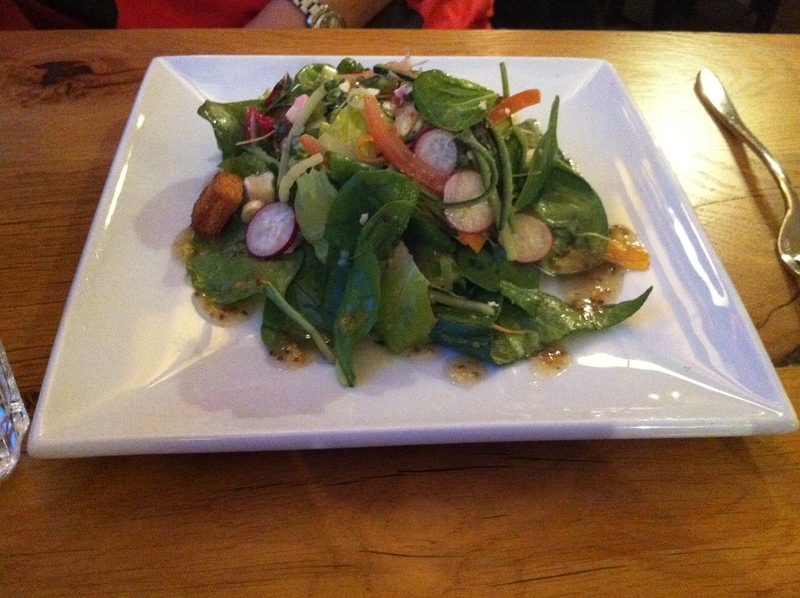 Ingrid had chosen the Square Kitchen Salad (£8) for her main: a combination of mixed leaves, goats’ cheese, beetroot, cucumber, tomato, radishes, carrots, croutons (unannounced on the menu!) and a pesto dressing. Maybe not the most adventurous of options to put on a menu, but simple, classic combinations of flavours done well. A thumbs up on the dressing from Ingrid too, who commented that it was nice to have a salad that, for once, wasn’t completely swamped with the dressing, but rather featured just enough for the flavours to come through. I, shock horror, also went for a vegetarian option! 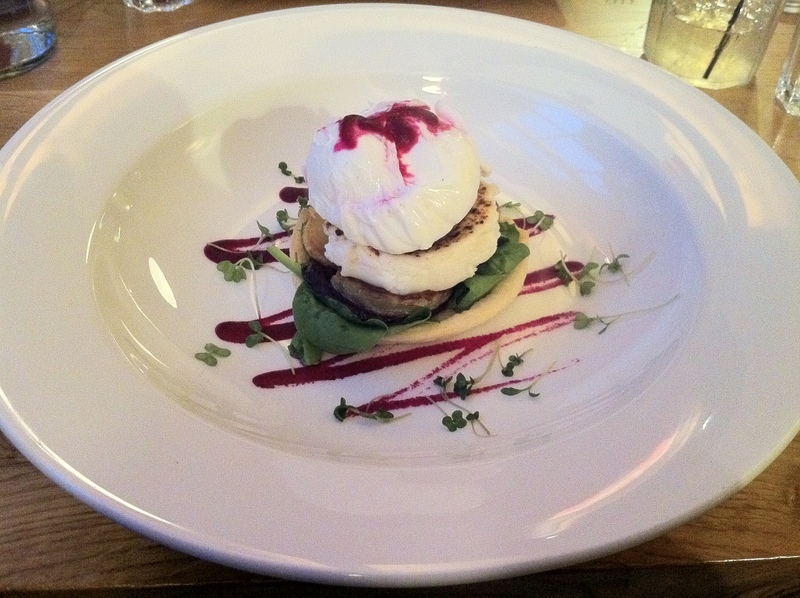 My roasted beetroot, potato and goats’ cheese tartlet (£11.50) was an impressive stack of the lightest pastry, layers of thinly-sliced beetroot and potato and a generous portion of creamy, crumbly cheese, all topped with a poached egg (perfectly runny yolk) and drizzled with a beetroot reduction. Again, classic combinations of flavours, with the ratios just right and the potato adding weight to what could otherwise have been quite a light dish. We passed on the desserts this time round, admitting defeat after two courses…it was tough to pass up the temptation of a peanut butter cheesecake with banana sorbet and honeycomb, though! Next time.